Almost a week has gone by without a new post! I have been getting some sewing done...mostly on the hand sewing travel table topper (EPP 60 degree diamonds). But even that doesn't get as much attention as I would like it to! So, I have three of my seven stars done for the table topper. I really enjoy seeing it come together. I can't wait to start adding the 'joining' diamonds. I was able to work on it in the car on the way to the birthday open house yesterday...but on the way home I started getting car sick while trying...so the ride home wasn't as productive. It was like being a kid in a candy store. My father-in-law used to do alot of sewing, so he had a huge trunk full stuff. Alot of it is still in large cuts...I see some great quilts in my future! This is some of the solids and larger cuts that are already washed & folded. I also found the inspiration for my NEXT hand quilting project...I can't believe I'm already thinking that far ahead! It is these vintage flour sacks that once belonged to Chad's great-grandmother. Here's some more of the already washed finds...some of it is already pre-cut squares for a Christmas quilt. I think that will be fun to decide what I want to do with them. So here is my fabric shelves awaiting it's newest additions...it should be filled up soon with all the great stuff I found...Thanks Dad & Mom Dickson! Yesterday was the Open House (Birthday Party) for Chad's grandma. She turned 90 years old. 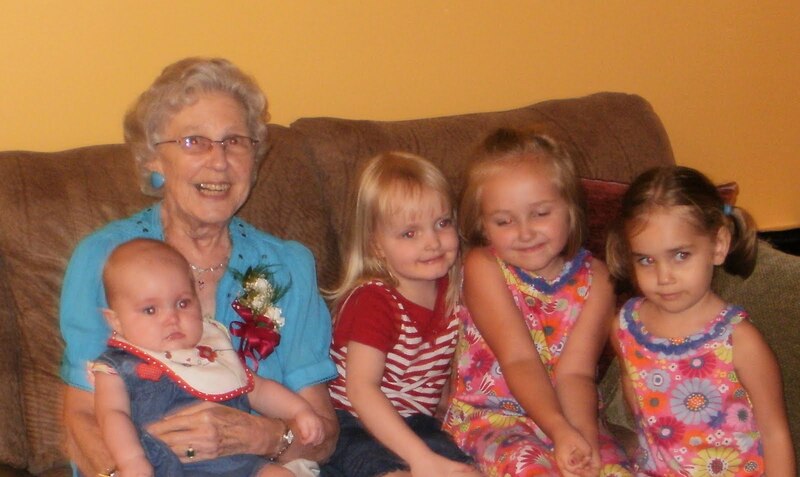 Here she is with her 4 great-grand daughters...however, none of her great-grand sons made the trip. But the girls played together and had a sleepover at "Big" Mama's (minus Amber :)). And then here she is with four of her five grandchildren. Mama enjoyed herself, at least she seemed to! I received some wonderful complements on the invitations...and has made me seriously consider selling some on Esty...does anyone have incite on starting to sell stuff there? I'm still working on patterns to also sell there, but they are a little slow going right now. I hope everyone had a great Memorial Day weekend. It went fast, but was mostly enjoyable...sunny and very warm here in NW PA. This weekend I heard this repeatedly...on a kids radio program on Saturday, during Pastor's message on Sunday, and again on Monday in the car on a recorded conference we listened to on our travels...so, I thought I should share it with everyone today! God doesn't allow things to come into your life without Him being there to help you get through it.﻿ We can't bear the temptation and trials of our lives alone, we need to let go and let God bear them for us. May your week go great...leaning on God along the way!